Art Garfunkel is famous for being a member of the folk rock duo Simon & Garfunkel. 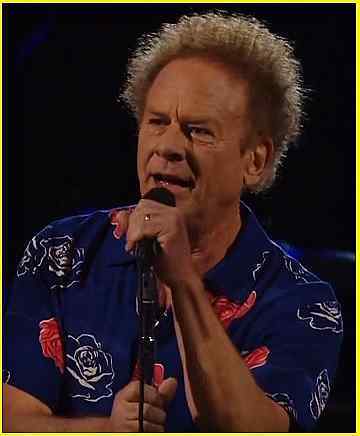 Garfunkel's solo music career has achieved success with a cover of Sam Cooke's (What a) 'Wonderful World' that reached #1 on the Adult Contemporary chart and #17 on the pop chart in 1978. His 1979 album Fate For Breakfast scored a #1 hit single in the UK with 'Bright Eyes'. Simon & Garfunkel's hits include: Mrs. Robinson, For Emily - Whenever I May Find Her, The Boxer, The 59th Street Bridge Song (Feelin' Groovy), The Sound of Silence, I Am a Rock, Scarborough Fair/Canticle, Homeward Bound (Live), Bridge over Troubled Water, America, Kathy's Song, El Condor Pasa (If I Could), Bookends, and Cecilia.